Raith Rovers moved into second place in Scottish League One after thumping Dumbarton while leaders Arbroath were held 0-0 by Stranraer. But the Red Lichties retain a healthy 13-point lead despite a 4-1 win for the Kirkcaldy side in which Kevin Nisbet scored twice. Rovers moved ahead of Forfar Athletic, who lost 1-0 away to Airdrieonians. Fourth-placed East Fife also stumbled, losing 2-0 at home to Brechin City, while Montrose beat Stenhousemuir 2-0. Stenny's defeat means they slip three points behind Brechin at the foot of the table. Nisbet took his tally to 27 goals for the season as Raith Rovers secured a fifth consecutive home win to bounce back from last week's loss to Forfar. Ross Matthews and Liam Buchanan scored for the Fifers inside 26 minutes, before Calum Gallagher reduced the deficit for the Sons, who went into the game unbeaten in seven matches. Forfar failed to hold on to second place as Airdrieonians ended their four-game unbeaten run, with Kyle Wilkie netting the winner just before the break. Stranraer boosted their hopes of avoiding relegation as a gutsy second-half display to earned a draw at home to leaders Arbroath. Visiting striker Bobby Linn came close to his 24th goal of the season when his effort hit the post just before the home side were reduced to 10 men shortly before half-time. 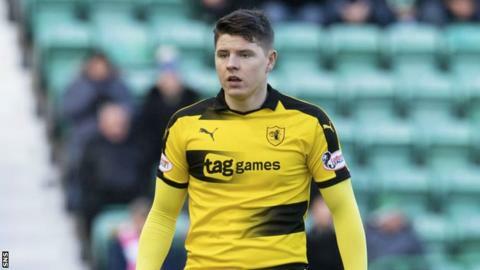 Goalkeeper Max Currie was shown the red card, his second of the season, for violent conduct when he clashed with Arbroath's Michael McKenna. It meant a league debut for 21-year-old Lyle Avci, who made a terrific save to deny David Gold after the break, while Darren Jamieson prevented Innes Cameron giving the 10 men a surprise lead. Brechin, who are now unbeaten in four, remain second bottom but are just two points behind Stranraer after beating East Fife. City led at the break courtesy of Dougie Hill's 33rd-minute effort before Ross Kavanagh doubled their advantage just after the hour mark. Montrose ended a three-game losing run as goals from Terry Masson and Martin Rennie secured their win over Stenhousemuir.